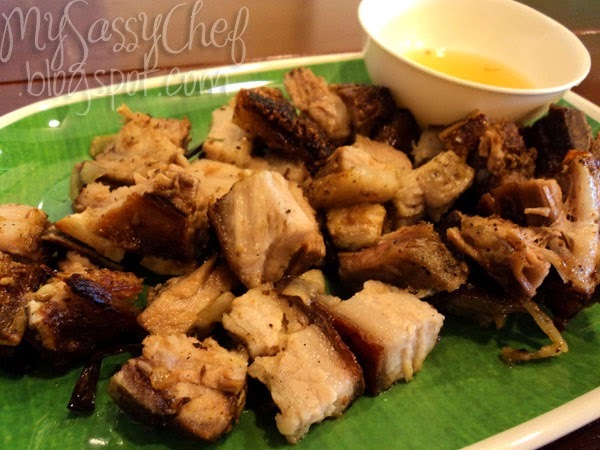 My sister has been raving about ChikBoy being a great fast food to eat in, and she claims that their lechon cebu was something you would like to eat when you're on a budget and still want some comfort food. It was weird when I heard her say it, because she is not fond of fatty foods, and she hardly ever likes any fast food joint. But then again, with the gloomy weather making me lose all my mojo in posting and doing my oDesk jobs, maybe comfort food in the form of roast whole pork cut into bite-sized pieces isn't such a bad idea. I was a bit turned off by the time the plate got to us, because the meat was all greasy. But hey, what's lechon without the fat, right? So I may have had a lot of high expectations for this one, but at the end of the day, I had better tasting lechon than this one. No, not from Metro Manila, but the ones I had from the provinces. 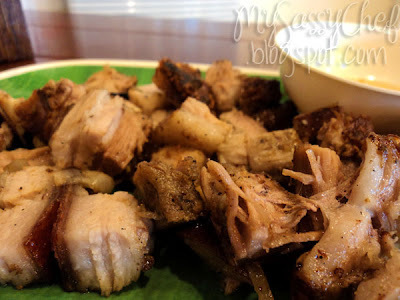 But Chikboy's lechon cebu is yummy, and their vinegar dip that's light and different than usual does amp up the flavor a lot. :) And yes, we did indulge, but not too much. The staff was friendly and kept offering us another free bowl of rice, even though we kept declining. tried their Lechon last summer and it tastes good too. OMG ito ang hinahanap ko! Now I am too hungry lol! Lechon Cebu was quite popular but since I'm not relaly a lechon lover, I can't really tell the difference.